Doctorpreneurs is the global community for doctors, medical students and individuals interested in healthcare innovation and entrepreneurship. We are a nonprofit organisation committed to transforming healthcare. With healthcare facing unprecedented challenges globally, we believe that unlocking the wealth of talent within the system will be key to driving radical change. Provide the next generation of medical entrepreneurs with the insight, network and opportunities to lead innovative improvement in healthcare. 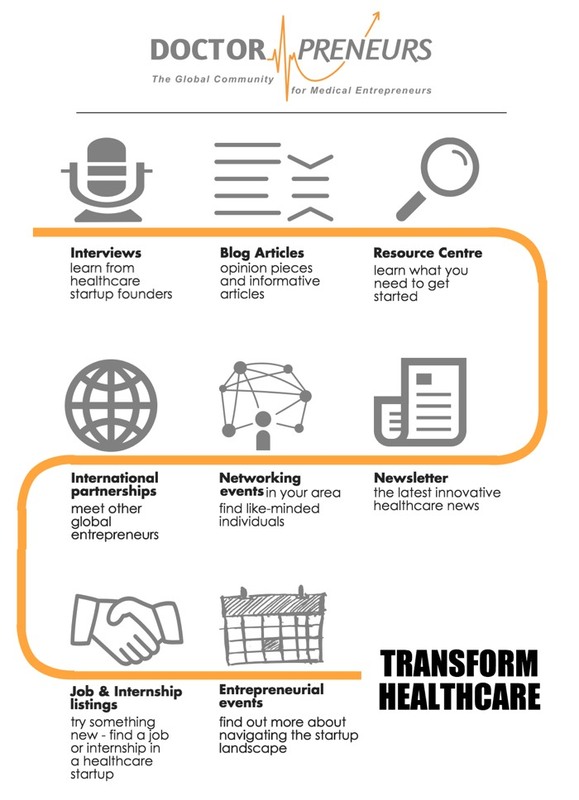 We inspire healthcare professionals and students to think creatively and embrace principles of innovation and entrepreneurship to improve healthcare; we connect our members with a network to help them learn and grow; and we accelerate members’ entrepreneurial journey through providing access to exciting opportunities. JOIN the community now. It’s FREE! Launched in 2011 as a means to connect doctors interested in technology and entrepreneurship, we focused on interviews with healthcare entrepreneurs (including many doctorpreneurs) and a series of popular events in London and Cambridge. These typically focused on founders ‘spilling the beans’ on the realities of starting and scaling a healthcare company, as well as sell-out events such as our Design Thinking for Health day at Judge Business School in Cambridge, organized in partnership with IDEO and the Cambridge University Centre for Entrepreneurial Learning. Several of these events were run with support from the Health Foundation. In 2014 Doctorpreneurs evolved and embarked on its next chapter. Under new leadership, the team grew and offering expanded. The focus shifted towards creating a unique resource and global community for the next generation of medical entrepreneurs. Recognising the importance of ‘learning from experience’, we have retained a focus on interviews with experienced entrepreneurs, and sought out opportunities to help members get actively involved and start their entrepreneurial journey. We run events in the UK and partner with leading international healthcare events. Our offering and team continue to expand and we have recently launched a popular podcast series, student ambassador network and the Doctorpreneurs Startup School.